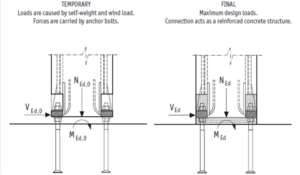 The anchor bolts seen in the fig1 below, are cast into either the foundation if a connection between column and pad foundation is required; or into the column head if a connection between columns is required. The column shoes, seen in fig2 below are cast into the base of the precast columns. The shoe in anchored into the column via the steel rods embedded into the concrete which are in turn welded to the shoe. When the precast column is delivered on site the construction process is very similar to that of steel construction. The element is simply lifted into position, and the anchoring bolts are aligned with the column shoes. The bolt below the column shoe is used for final adjustment of the column position and level. When the final position is achieved the second nut above the column shoes can be tightened. At this point the column no longer requires propping, and the forces are transferred directly through the anchoring bolts. The final stage is to fill the gap between the column and its base with non-shrink grout. After this has been carried out and the grout cured, applied loads are no long supported entirely by the anchor bolts but also through the concrete. Eliminate the need for on-site welding.